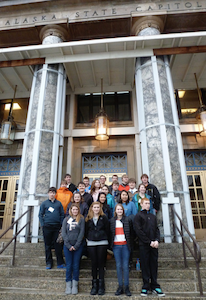 Held twice each legislative session (Feb. and March) in Juneau, the Fly-ins equip you with the basics of the legislative process and help you connect with your legislative delegation. In addition to meeting with their legislators, board members learn about legislation that will impact their district, issues influencing education in Alaska and the nation, how to be more effective leaders on their board, successes of other districts across the state, and more. Additionally, the February Leadership/Fly-in welcomes students to participate in the Youth Advocacy Institute (YAI). YAI offers an opportunity for students from across the state to hone leadership skills and develop a strong voice in their school and community. For more information on YAI, contact Claudia Plesa.